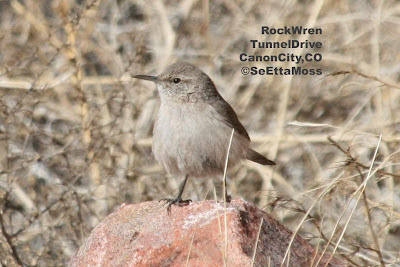 Though I don't know of any relationship to the previous post about birds wintering further north related to Climate Disruption (better term than Global Warming or Climate Change), Canon City has had wintering Rock Wrens at Tunnel Drive for some years. This is noted in "Colorado Birds" that was published in 1992. And it has been my experience at least for the past 10 years. This pic is one I took of a Rock Wren I found at Tunnel Drive. Double-click on it for a nice close-up.